Everyone should have the opportunity to learn saxophone. Until 11:59pm (GMT) Sunday 4th November I've launched an amazing offer for you to take up. There won't be a better opportunity than this to get World Class Saxophone Tuition and really become the sax player that you always wanted to be for the very best value. The clock is ticking, come learn saxophone with me today! An ENTIRE YEAR of Sax Lessons with 24/7 Access to Video Lessons, Courses, Backing Tracks and Sheet Music. Including the upcoming Christmas Content!! 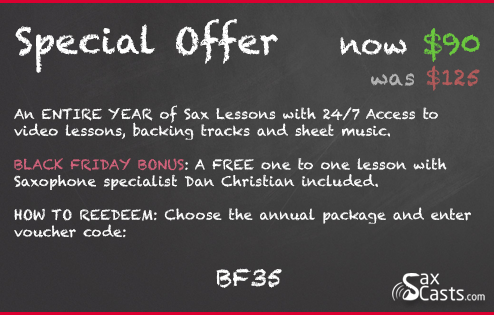 A FREE ONE to ONE lesson with Dan Christian. I usually charge $60 per lesson so this is absolutely great value. Structured Guidance, no trawling through hundreds of videos wondering where to turn or where to go next. The SaxCasts library teaches you how to play Saxophone step by step. If you're struggling to see the above voucher for any reason you can view it by clicking here. I hope you'll come join me at SaxCasts and let me help you become the very best Sax Player you can be. Dan has dedicated his life to teaching people, just like you, saxophone. He is acclaimed for his knowledge, approach and attitude toward teaching and currently has over 3.5 million YouTube views of his lessons.